This recipe takes about two hours, and makes a dozen apple rose tarts. First: the dough. Combine flour, sugar and salt and mix. Dice butter and add. Squish butter and flour mixture by hand until it resembles course meal; about 3-4 minutes. Add no more than 3 tbsp. cold water and continue to mix until dough forms into a ball. Wrap in plastic and refrigerate for at least 20 minutes. This makes the dough easier to roll out. While dough refrigerates, slice apples. Cut apples in half and core, then use a mandolin or fine knife skills to slice apples as thinly as possible. Think the width of a penny. 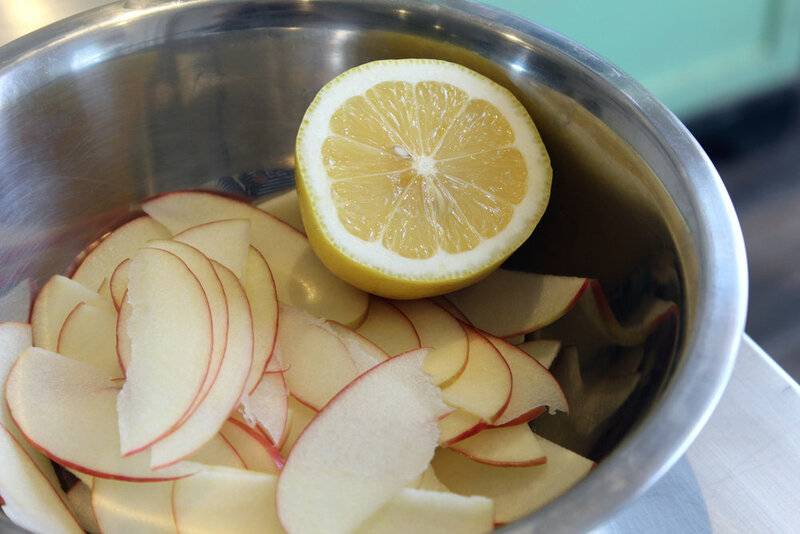 Squeeze lemon juice over apples to keep them from browning. Make some simple syrup in a sauté pan (1/2 c. sugar + 1/2 c. water), then cook apple slices until they're bendy enough to roll up without breaking. When dough is chilled, split in half and roll out. Use one half to cut discs small enough to fit into your muffin tins; cut strips about 1/2 inch thick with the other half. You'll use these strips to hold the apple slices together. After your apple slices have cooled enough to handle, lay them out in a line, overlapping halfway. You want this line to be about a foot long. Start with the first apple slice you put down and roll all the way to the end. The apples are a little sticky from that simple syrup, they should hold together easily. Look at that pretty rose! Go you! 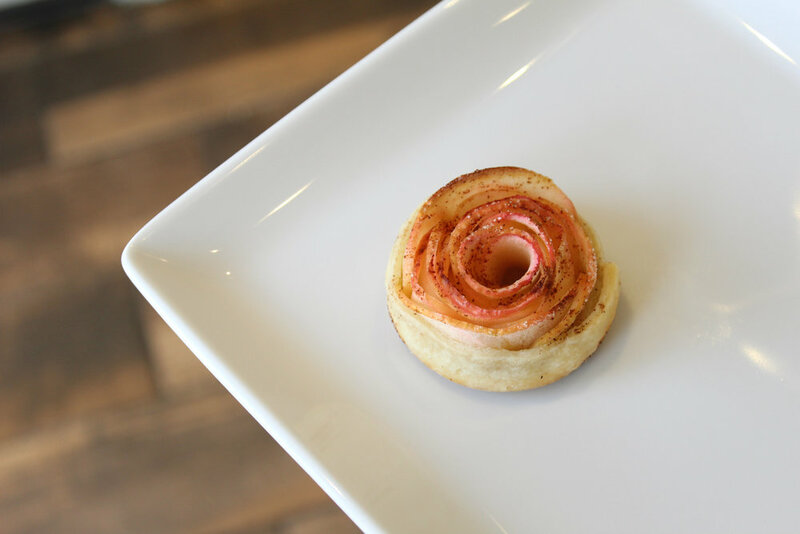 Set the apple rose in the middle of your disc of dough and pinch around the apple to keep everything together. Take one of those strips of dough and wrap around the base of the flower. You can use some water to use as glue on the dough. Sprinkle a little flour in the muffin tin to keep your tarts from sticking. Dust the top of your apple roses with sugar and optional cinnamon! Bake for 30 minutes, or until crust is golden and apples are crisp.